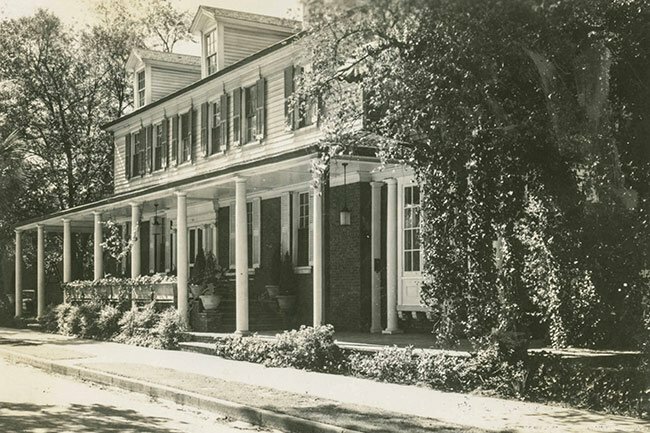 Thought to be the oldest existing home in Columbia, the Seibels House – also known as the Hale-Elmore-Seibels House – was built entirely of hand-hewn lumber by A.M. Hale. Like much of contemporary Columbia, the Seibels House stands on land once owned by Colonel Thomas Taylor, who operated it as a plantation. The home’s exact date of construction is unknown, due to the loss of records by fire, but the date “1796” is carved into one of the beams in the basement. With the first level featuring masonry construction and the second level, clapboard, the house plan is typical of many South Carolina homes featuring two rooms on either side of a central hall. The front rooms are about 24 feet square with high corniced ceilings; the floor plan is repeated upstairs. The front porch of the home spans the entire facade and is broken only slightly by steps on either end. The piazza once extended to three sides of the home but now covers just two as the portion on the east was replaced with a sun porch in 1900. The house was used as an antique store which was known as the Picriccorn House (PICkens and RIChland CORNer) when it was owned by George R. P. Walker, a grandson of John Jacob Seibels. 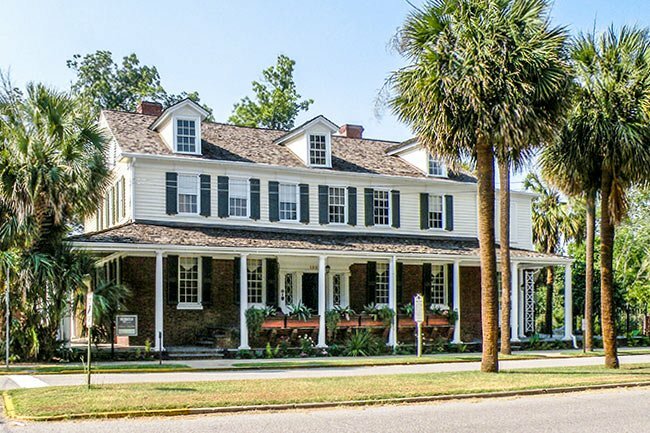 The house was donated to Historic Columbia in 1984 and serves as its administrative office. The house and gardens can be rented for events and continue to be a popular destination for weddings. (Seibels House) Possibly the oldest house in Columbia, the Seibels House was built entirely of hand-hewn timber by A. M. Hale on a portion of the Thomas Taylor Plantation. Due to loss of state and local records by fire, the exact date of the house cannot be determined. However, there is record of the date 1796 carved on one of the hand-hewn timbers in the basement. The house was later purchased by Captain Benjamin Elmore, who then sold it to Mr. John Jacob Seibels. It is two-and-one-half-stories with Georgian lines. The first story, with wide doorway and sidelights, is of brick with four large shuttered windows. The second story is clapboard with six unshuttered windows. Piazzas on the front and the west sides of the house are supported by slender Doric columns. Piazzas formerly extended on three sides; east piazza replaced ca. 1900 by the addition of a sun porch on the first floor and a room on the second floor. Other additions include extensions enlarging the first and second story rooms on the back northeast corner of the house. Mantel pieces are believed to be original. Listed in the National Register May 6, 1971. Thank you for this post. It’s very inspiring.